Energy Dispersive X-ray Fluorescence (EDXRF) analyzers for non-destructive elemental analysis of sodium (Na) through uranium (U) — in solids, liquids, powders and thin films — from parts-per-billion (ppb) levels to 100%. 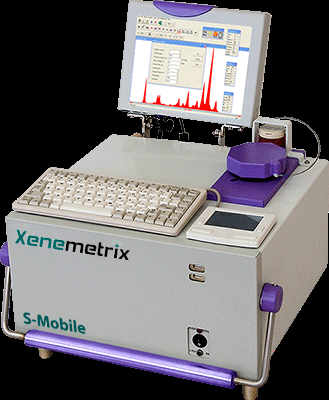 Located in Israel with a subsidiary in Austin, Texas USA Xenemetrix is dedicated to designing, manufacturing and supporting EDXRF benchtop spectrometers/analyzers as well as laboratory and mobile elemental analysis instrumentation. We bring 30 years of experience to the field. Xenemetrix has a worldwide distribution and support system. S-Mobile Brings the power of laboratory spectrometer to the field A small compact analyzer that can be taken to the job site. When the task calls for fast real time high quality results the S-Mobile meets the job description perfectly. This powerful 50kV, 50 Watt portable X-ray analyzer is capable of sensitive, precise analysis that you would expect from a laboratory class analyzer. The ease of use, portability and fast precise analysis makes this instrument the best choice for field surveys or mobile laboratories. • Elemental analysis Na(11) - U(92) from single ppm to 100% concentrations. • Portable with robust design, suitable for demanding field applications. • Six customizable filters ready to optimize your application. • Impressive performance thanks to 50kV X-ray tube. • Improved and impressive limits of detection. • Easy to operate thanks to proprietary nEXt™ software package. • New improved fundamental parameters software (optional). Key Applications: Alloys; Environmental; Oil, Fuels & Liquids; Mining & Geological; Forensics;Authentication & Precious Metals; Pharmaceutical & Biomedical. S-Mobile SDD Brings the power of laboratory spectrometer to the field A small compact analyzer that can be taken to the job site. When the task calls for fast real time high quality results the S-Mobile meets the job description perfectly. This instrument features Silicon Drift Detector which enables higher count rates, higher energy resolution at low electronic noise. This configuration translates into a very powerful field instrument capable of delivering your analytical needs faster and more precisely. • Elemental analysis Na(11) - U(92) from single ppm to 100% concentrations. • Portable with robust design, suitable for demanding field applications. • Fast response and high resolution Silicon Drift Detector. • Impressive performance thanks to 50kV X-ray tube. • Improved limits of detection, thanks to SDD. • Easy to operate thanks to proprietary nEXt™ software package. • New improved fundamental parameters software (optional). Key Applications: Alloys; Environmental; Oil, Fuels & Liquids; Mining & Geological; Forensics;Authentication & Precious Metals; Pharmaceutical & Biomedical. 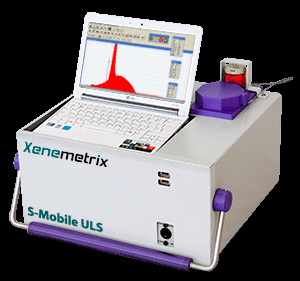 S-Mobile ULS Brings the power of laboratory spectrometer to the field This portable analyzer is specially adapted for Ultra Low Sulfur applications. Complies with the latest and most severe international standard methods for low sulfur concentration levels analysis: ASTM D7212, D4294 and ISO 20847, IP531 . Suitable for field or laboratory ULS applications, this powerful 50KV/50W EDXRF system delivers sensitive, precise and quick-response performance. • Ultra Low Sulfur analysis capabilities, MDL lower then 1ppm . • Ideal for ULS applications in diesel, oils, fuels, gasoline and other distilates . • Portable with robust design, suitable for demanding field applications. • Impressive performance thanks to 50kV X-ray tube. • The powerful and friendly software platform provides full qualitative and quantitative determination of ULS levels .Key Applications: Petrochemical; Oils, Fuels and Diesel. Key Applications: Petrochemical; Oils, Fuels and Diesel. 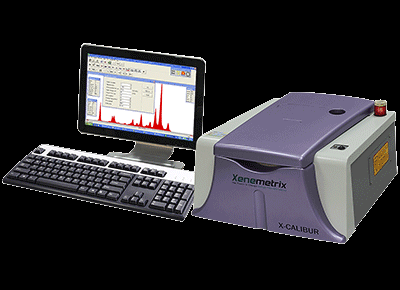 X-Calibur Bench Top EDXRF Spectrometer; fast, accurate, easy to use Xenemetrix’s X-calibur Energy Dispersive X-ray Fluorescence (EDXRF) spectrometer offers the most convenient price: performance solution in the market for elemental analysis. The compact spectrometer fits conveniently on a traditional laboratory bench and includes a completely integrated computer system. The robust design and build make the instrument ideal for a mobile laboratory. It meets MIL 810E specifications for shock testing. The analyzer provides non-destructive qualitative and quantitative determination of Sodium through Uranium. The end result is a clearly exceptional product, able to deliver powerful analytical results today and into the future. This exciting evolution in Xenemetrix product line delivers performance capabilities similar to traditional liquid nitrogen-cooled detector units by achieving similar resolution to LN2 cooled Si(Li) detector. The unique front-anode geometry of these X-ray tubes, together with an advanced optical design, permits extremely close coupling to the sample resulting in increased sensitivity. The small footprint of the instrument minimizes space requirements without compromising performance. Robust instrument This is our new bench top version for hard/field environments where a stiffer and more durable outer case is needed. Key Applications: Petrochemical; Polymers; Metallurgical; Environmental; Minerals. X-Calibur SDD Bench Top EDXRF Spectrometer;versatile, high energy resolution Our X-Calibur SDD EDXRF spectrometer features similar configuration like X-Calibur but with Silicon Drift Detector. Thanks to SDD high count rates the instrument improves its response time thus minimizing down time. The SDD enables extremely high countrate applications with excellent energy resolution - 136eV FWHM, with the natural advantage of being Liquid Nitrogen Free. Furthermore, thanks to SDD special design and its low electronic noise, improved sensitivity is achieved for most applications. Robust instrument This is our new bench top version for hard/field environments where a stiffer and more durable outer case is needed. Key Applications: Petrochemical; Polymers; Metallurgical; Environmental; Minerals. X-PMA Precious Metals EDXRF Spectrometer; fast, accurate, easy to use XRF is a non-destructive analytical technique that can rapidly and easily identify and determine the presence of various elements such as gold, platinum, silver and other precious metals present in solid, powdered and liquid samples. No sample preparation is required and also very small samples can be analyzed using the micro spot beam. 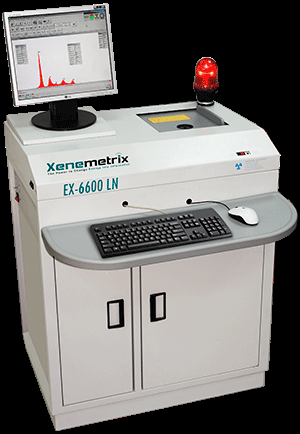 The essential advantage of using Xenemetrix X-PMA analyzer is high precision and high accuracy. 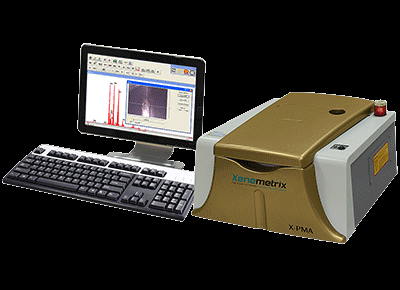 With Xenemetrix X-PMA you will speed up your process: position the sample, run the analysis and get results at the touch of a finger. Robust instrument This is our new bench top version for hard/field environments where a stiffer and more durable outer case is needed. Key Applications: Jewelry; Watch trade; Gold and precious metals determination; Purity determination; Sorting applications; Recycling companies; Dental alloys determination. RoHS Vision The Fast and Easy Method for Ensuring Compliance; with Regulations for Hazardous Substances The Restriction of Hazardous Substances Directive (RoHS) restricts toxic metals in electrical and electronic equipment. Xenemetrix’s new RoHS Vision uses a high resolution detector, a software integrated camera, and a powerful X-Ray tube with variable spot sizes to accommodate large and small samples and to measure extremely low levels of restricted substances. The fast quantitative analysis allows manufacturers to comply with the new regulations. Automatically identifies the matrix components and selects optimal acquisition parameters for samples of various matrices, thicknesses, and sizes. • Get the restricted elements precisely analyzed in seconds! • Integrated camera and micro X-Ray spot to fully identify the area of interest. • Automatic matrix identification allows nontechnical personnel to operate the instrument with high degree of confidence. • Intuitive and friendly proprietary software. Robust instrument This is our new bench top version for hard/field environments where a stiffer and more durable outer case is needed. Key Applications: RoHS/WEEE compliance testing and screening of regulated elements (Pb, Hg, Cd, Cr, Br). 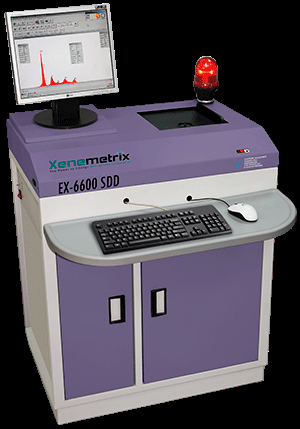 X-Cite Bench Top EDXRF Spectrometer; economical, accurate, easy to use Xenemetrix’s powerful X-Cite benchtop Energy Dispersive X-ray Fluorescence (EDXRF) spectrometer enables system operators to identify the elemental composition of samples. The analyzer performs non-destructive qualitative and quantitative determination of Sodium through Uranium (Na-U). The X-Cite system utilizes 35kV, 9-watt X-ray technology to analyze samples without damaging them. This approach is particularly valuable in applications where limited sample quantities are available or where sample integrity must be preserved for other purposes. The innovative unit outperforms traditional systems without the cost and difficulties associated with liquid nitrogen cooling. Full computing capabilities are integrated into the system’s design for comprehensive data analysis and transfer. Robust instrument This is our new bench top version for hard/field environments where a stiffer and more durable outer case is needed. Key Applications: Petrochemical; Construction; Academic; Pharmaceutical; Minerals; Forensics.